My thatched cottage was built by the blacksmith circa 1650. All the fires and working bellows are original. By the Twentieth Century and the advent of the internal combustion engine, the shop metamorphosed at various times into electrical, musical and cycle varieties. One owner, as the retired curator of nearby Littlecote House, made it a treasure trove to the arts. As a goldsmith and lover of art, I have restored and transformed my home into a secret den for painters’, sculptors’, photographers’ and jewellers’ exquisite work for your perusal, pleasure and purchase. For those wishing to travel from afar and stay, I have converted the stable into a comfortable self contained lodge. There are scores of great restaurants and pubs, breathtaking walks and cycle routes, plus places of significant historical interest, such as Avebury and Stonehenge stone circles relatively close by. This festive season, on walking through The Smithy door (mind your head) next to the bellows, my first exhibits are four framed prints by my dear friend, Lucinda Roper, in her “Animals & Underwear” series, priced at £360. I also have one sensational “Bull & Bra” oil painting by this nationally renowned and widely collected artist, £3,000. Maintaining the racey theme that The Smithy governs, are my girlfriend and her best friend’s provocative and ethereal photographs. BamBam look to explore their desires and feed an insatiable need for madness and the marvellous. Their aim is to capture intimate fantasies and make magic out of raw femininity. Large single framed portraits £200. Triple framed photos £300. Given the historical import of the room, I am delighted to exhibit a number of metal sculptures by celebrated local blacksmith, Melissa Coles. 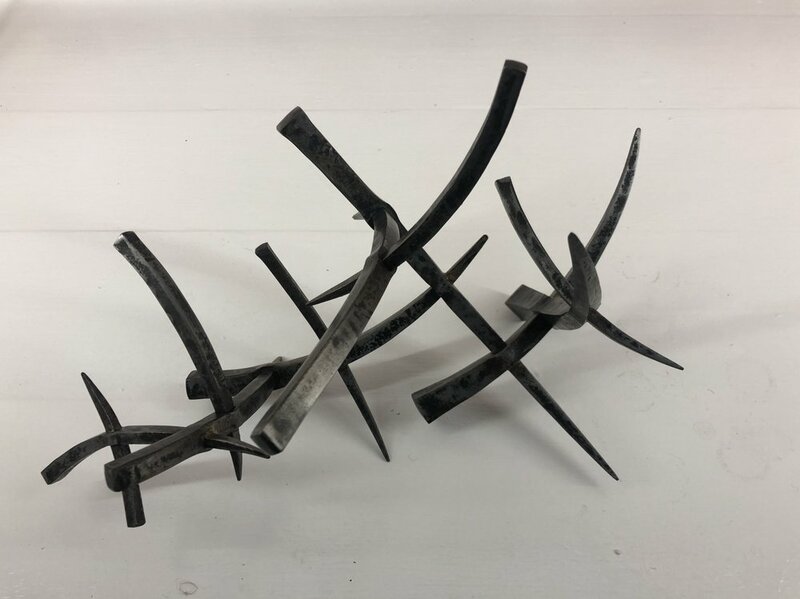 The two “Spinosity” pieces on display, £1,600, are made of forged steel in the tradition of the cottage’s heritage and are inspired by birds’ nests. “Fleet of Foot”, a magical twist of form and feathers, is 98cm long, made in forged steel and suspended by ribbon, £3,000. GUY&MAX jewellery is represented in The Smithy by three seperate displays in our timeless Birdcage and Deco, plus celebrated Digital Nature, styles. The perfect Christmas gifts whether spending £200 or £20,000. Just ask me about your own specific jewellery desires as I have a two tonne safe full of our creations. Moving from The Smithy to the Kitchen (mind your head) are a series of microscopically detailed oil paintings in form and landscape by Keith McAllister. Keith grew up in Africa, the son of an Irish missionary, and subsequently developed an immaculate skill to paint big game animals. Settled now with his beautiful wife and son in east England, Keith plays with bright light and skulking skies in these contrasting British scenes. Deer and willow paintings, £3,000. 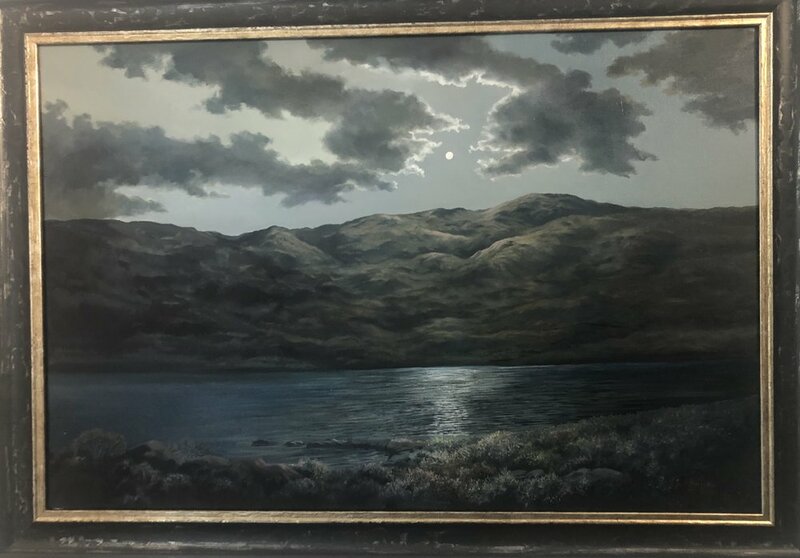 “Loch Tell”, £5,000. Head on through (mind your head) to the Bridge Room where I am very honoured to present hugely popular artist, Laurence Coulson’s incredible series of landscapes. As art critic, David Lee, commented, “Lawrence Coulson generously gives us what we like and need, those feelings of solitude and escape in wide open spaces under heavens so high they might reach to the end of the universe”. The depth of these pictures reminds me of a psychedelic journey when close up. I have them exclusively for this season only as Laurence has pre-sold the remainder elsewhere. If you love these pieces, please grab them now. Small £2,500, medium £3,000, large £3,500. The centre of the room is dominated by Melissa Coles’ 142cm 19th century wrought iron and stone sculpture, “Line, Form, Space”, £2,400. Three of Melissa’s charming “Tings” seemingly squirm at its base. Big £700. Small £550. Forged steel with a surprise tinkling secret inside. GUY&MAX jewellery is represented in the Bridge Room by our traditional Vintage and outrageous Algorithm styles. Every piece tells a story. Luckily for you, I will be on hand to tell you. Pop into the Garden Room (mind your head) and remember to sign, comment and leave your contact details in the visitors book please. To your right are six fabulous paintings by massively successful published artist, Paul Apps. Five vibrant Cornish and one Venetian scenes are £600 each. Head back through to the Bridge Room (mind your head) and on to the Sitting Room (mind your head). Relax on the sofa, having grabbed your favourite piece of Henry Swanzy’s sublime wood sculpture and digest its tactile qualities. The “Skates” in Brown Oak, English Oak and Olive Ash are £400-800 and the “Molluscs” in English Ash, British Elm and English Walnut with (open them!) scorched finishes (£900-1,600). Last, but by no means least, we have the sensational Rosy Modet’s portrait and landscapes in lavish spoonfuls of oil. Along with we Shepherd Brothers, Rosy studied art at Marlborough College, then Byam Shaw (now part of Central Saint Martins) and won a scholarship to the Art Student League in New York. 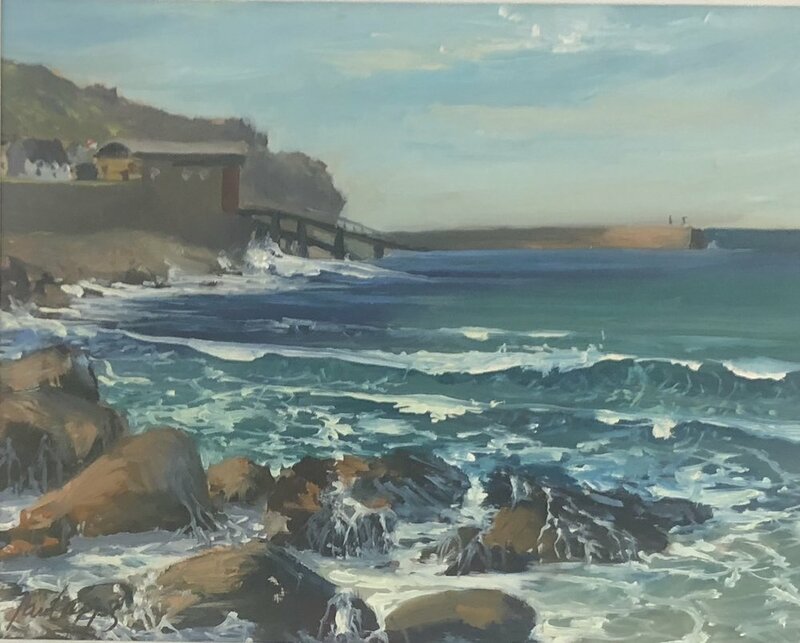 Now settled in Catalonia with her fab husband and gorgeous daughter, Rosy presents a mixture of rural, coastal and human scenes with intensity and humour. Small framed beach paintings £400. Mid size framed landscapes from £900 to £1,500. Unframed “Hot Gossip” £1,900 (when framed £2,000) and the stunning “Bathers”, £2,500. Now you have finished your tour, pull up a chair in the kitchen (mind your head) and enjoy a cup of tea, coffee, glass of wine or gin and a scrumptious mince pie or whatever festivities your host has lovingly created. I’m afraid I talk rather a lot so just humour me with a plausible excuse and a “Happy Christmas” when you need to leave (mind your head). Many thanks for celebrating this most beautiful place with me.